Relatives flying in to hound you this month? 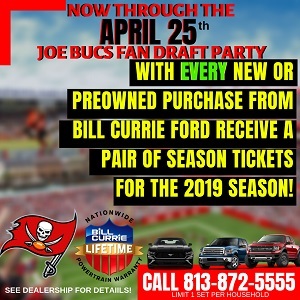 Heading out of town for a Bucs game? Why deal with the airport when Paradise Worldwide Transportation can do it for you? Remember that Paradise Worldwide Transportation is ready 24/7 to accommodate all your travel needs. Joe highly recommends Paradise. This is top-shelf reliability and service at competitive rates. Paradise Worldwide Transportation is a tremendous Tampa Bay company with service worldwide, so you can book airport transfers or corporate transportation easily — anywhere. One phone call gets the job done. And, of course, Paradise also has superior Tampa party buses, fancy stretch SUVs and so much more in their fleet. Need a limo Tampa? Make it easy and call Paradise Worldwide Transportation today at (800) 729-4713. Or click above to visit Paradisewt.com.